Few days ago, I received one of the best GTX 580 in the world: EVGA’s Classified model with 3GB of graphics memory. I plugged this big card on my testbed and… ouch! No way to start the system. The system starts and half a second later the PSU shuts down. WTF? The PSU is a Thermaltake Toughpower Grand 1050W (I reviewed the 850W here). 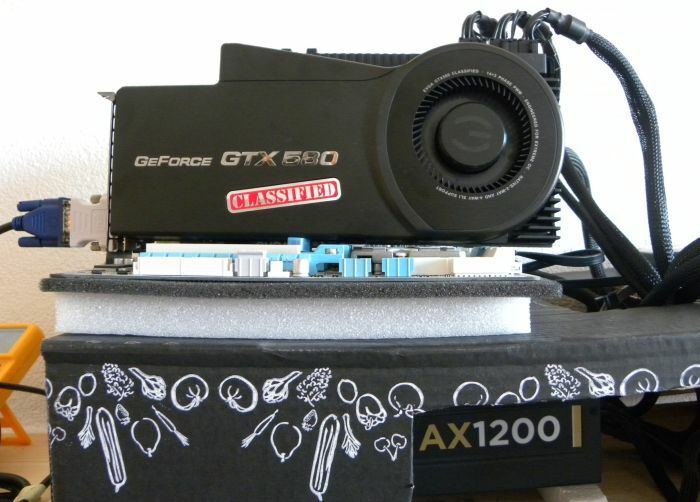 Seems the GTX 580 Classified (I think the responsible is the 14+3-phase power circuitry –VRM) is a bit too greedy and needs a PSU that can support some important peak current at the startup. Like an electrical engine! I replaced Thermaltake’s PSU by Corsair’s AX1200 one. Yes! My testbed can now start up! Conclusion: with an ultra-high-end graphics card like the GTX 580 Classified, always check your PSU: can it handle your new monster? More about this awesome card in an upcoming review! From an engineering point of view, that’s just an faulty electrical layout. If this card would be contructed like it should be, it would never ever draw such an huge current at startup. this is getting crazy..they really need to work on getting the power consumption down on video cards for the medium to highend desktop market..it seems to be the only sector that doesnt care about energy consumption..
better to have only one +12V ?